Stir fry makes food rich, delectable and distinctly flavorful making it a consuming infatuation for many across the globe. The magic that oil and temperature can do to vegetables or meat is evident in its mesmerizing aroma, when ingredients begin to caramelize, flavors intensify and the dish picks up color and texture. Ingredients dice, cube, strip or slice? 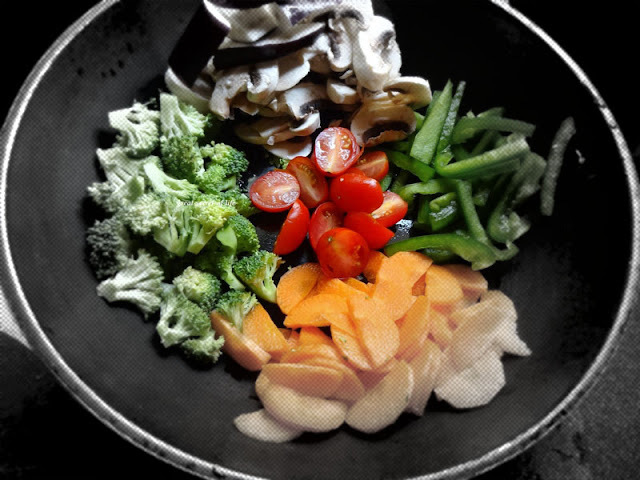 Cooking with no sense of refined artistry cannot go with stir fry which is ideally subtle and sophisticated. You can't expect to be rewarded for a soggy or a lumpy dish. Although basics go down to stirring vegetables or meat in even heat while they are cooking, every stir fry calls for ingenuity. Seasoning like garlic, ginger, scallions, onions, wine, egg, soy sauce, black bean sauce, vinegar and cornstarch are broadly used in different ways and combinations. Cooking times also call for a grateful consideration, while working with a different assortment of vegetables. Carrots, onion and cauliflower are cooked for longer durations in comparison to mushroom, zucchini, tomatoes or green onions which stir fry instantly. Oil tends to break down and turn bitter if it's heated above its smoke point not only loosing flavor but also diminishing its nutritional value . Heating above the smoke point causes a bluish smoke to arise. The oil may also produce carcinogens at this point. So, picking the right oil for any type of cooking is also an essential skill to imbibe. Extremely Refined oils have a higher smoke point since the ingredients that smoke up have been removed from it. Stir fry is traditionally done with peanut oil. However, different oils like vegetable, corn, sesame or canola may be used that complement the ingredients and flavors of the dish. The utensil has to be something light weighted in which heat can be evenly distributed and vegetables can be tossed vigorously without creating a mess. Stir fry come with a lot of splatter so the utensil has to ensure that hot oil sizzle doesn't reach the hands while stirring or tossing. 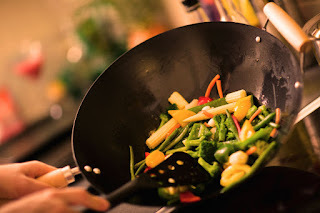 A wok's flared sides make it an ideal utensil in comparison to a skillet which doesn't have flared sides. Others things like a lid, spatula, colander and set of slotted spoons also come handy. Searching for the Best B.Sc. Hotel Management and Catering Technology institute in Punjab or Chandigarh? Hospitality as a profession doesn't embody the boring nine to five jobs with the same routines. Professionals in this field have robust experiences and take up new challenges on a daily basis. At Desh Bhagat, institute of Hotel Management and Catering Technology students dive into fundamental concepts of hospitality looking into essential aspects that transform hotel experiences.